• To develop proposals for consolidation of the RCC mechanism. 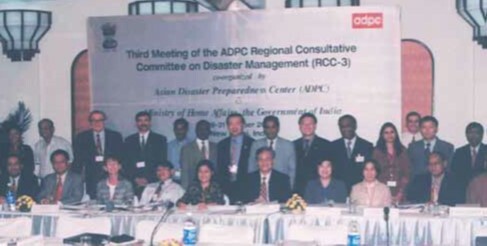 As a recurrent theme of previous RCC meetings, regional cooperation was further discussed, specifically, initiatives taken under the framework of the United Nations Disaster Management Training program (UNDMTP), international and regional bodies operating in the region such as World Meteorological Organization (WMO), WMO-ESCAP Tropical Cyclone Panel, and SAARC. ADPC also provided a brief overview of RCC and other regional programs including Asian Urban Disaster Mitigation Program (AUDMP), Pacific Earthquake Engineering Research Center (PEER) and Economic Commission for Europe (ECE). The capacity building needs of RCC member countries were discussed, for example, emergency response and coordination, reconstruction and rehabilitation, training of trainers, disaster management orientation of different stakeholders, damage assessment and needs analysis, specialized workshops on planning, and public awareness (main target group: school children). Based on trends and advances in drought preparedness and management provided by countries, key target groups for capacity building were identified, and priority themes for training. The South East Asian delegates identified country priorities: for Cambodia and Viet Nam: training for community leaders; Thailand: training for officers at national and provincial levels on disaster management fundamentals; and Philippines: enhanced skill training for search and rescue workers. Similarly, South Asia and Central Asia also identified their priorities. The establishment of priority action areas in capacity building of national disaster management systems and the promotion of regional and sub-regional cooperation to enhance the effectiveness of the existing mechanisms was also attained. Key recommendations were given for cooperation, for instance, capacity building in wildfire management, Mekong Delta Cooperation in flood management, ASEAN cooperation in disaster management, and South Asian cooperation for making an action plan on disaster management. On the key theme of droughts, thorough discussions yielded great ideas: designing a common strategy and program for managing land and water resources in the region; developing a regional database of hazards, vulnerable areas and drought management practices; and recognizing river basins as a geographical unit for starting cooperation and building on existing cooperative programs of various regional agencies. In addition, institutions including United Nations Development Programme (UNDP), The International Crops Research Institute for the Semi-Arid-Tropics (ICRISAT), International Union for Conservation of Nature (IUCN), United Nations Office for Disaster Risk Reduction (UNISDR) and ADPC, showed their initiatives and interest for partnership in the area of drought management in the region, and activities for the improvement of drought early warning system were also identified. Finally, the RCC3 meeting also recommended the plan to provide a ‘Primer on Urban Disaster Mitigation’ (UDM) and a primer drawing on recent experiences such as good practices, lessons learned in Urban Disaster Mitigation initiatives of AUDMP, other programs of ADPC, and from individuals and institutions dealing with aspects of UDM within and outside Asia.